There are so many lists of those "must-have" wedding photos. I think I speak for many wedding photographers when I assure brides and grooms around the world that we know we're supposed to take shots of your bridal party, bouquet, and first kiss as husband and wife. Promise. What we're more interested in are the details, seemingly small, that can actually make a big difference in helping to create a collection of stunning wedding images. And some of the details that can be so useful have been left off of those aforementioned lists of "must-haves." 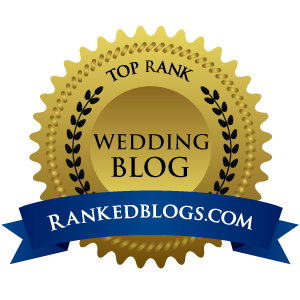 They often go completely overlooked but, with a little bit of forethought, can make a significant impact on the sweet moments of your big day. 1. Write your vows on something prettier than hotel stationery or, worse, on your cell phone! 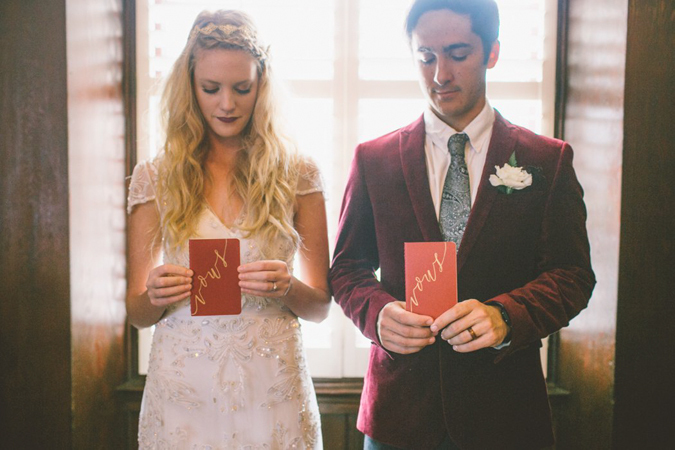 Personally, I love the idea of these vows notebooks to hold the words for your beloved, or you can get a little more specific with “his” and “hers” versions or even customized with your names. And, of course, a plain little Moleskin notebook works just as well! Giving one of these to your fiancé is good insurance against the last-minute possibility that he’ll jot vows on a piece of scrap paper or the back of a receipt, neither of which look very romantic in photos. 2. Pay attention to the light when choosing a venue. When you’re shopping for a ceremony space, visit during the same time of day when the ceremony will take place (take daylight savings time and season into consideration as appropriate). 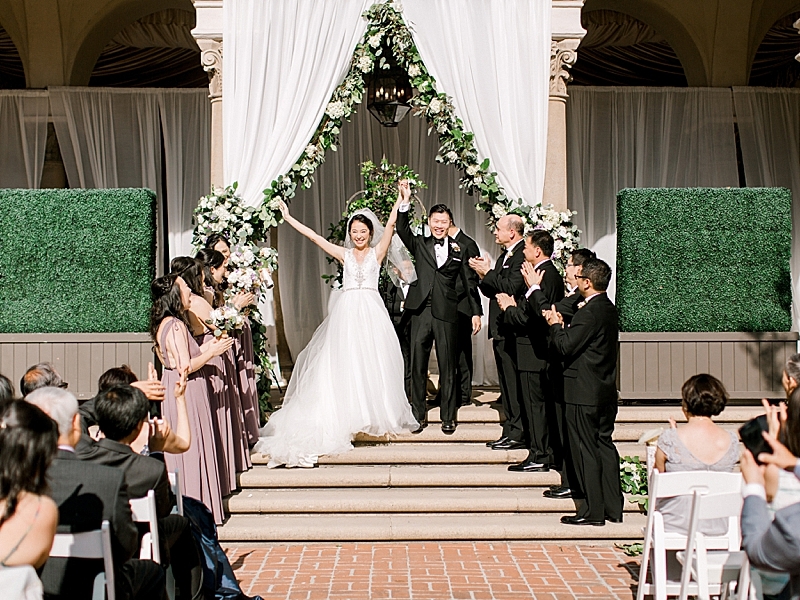 For a mid-summer wedding in Southern California, a start time between 5:00 and 7:00 p.m. with your guests facing west is a photographer’s dream for a ceremony outdoors. The backlighting casts a beautiful glow on your ceremony, and generally means you won’t be squinting at your future husband as you say “I do.” Now, if your dream venue doesn’t have the perfect ceremony setup, that doesn’t mean you should scrap it as a contender for hosting your big day. 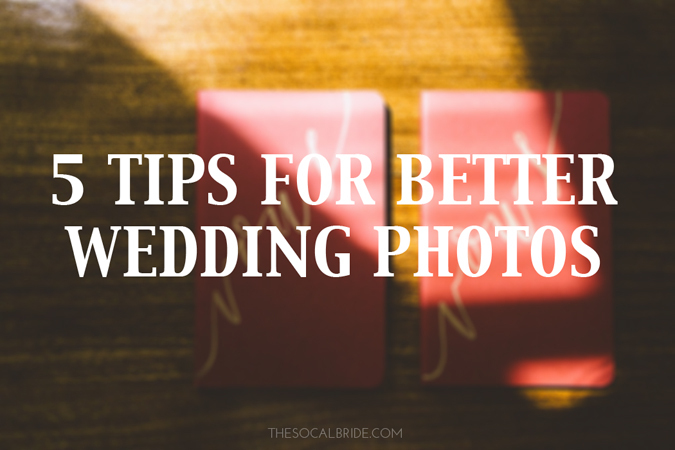 It’s just one of many considerations, and it’s important to know that the orientation of your ceremony will affect your photos. A good wedding photographer can work with any lighting situation, but it helps if you know what to expect from the finished product if your altar is in direct sunlight, dappled light under leafy trees, or half in shadow. Plus, you won’t get soft, glowy ceremony images if you have a 1:00 p.m. invitation time. That’s not a priority for everyone! But if it is, plan accordingly. 3. Have an engagement session. Having a pre-wedding photo shoot with your photographer is a surefire way to feel more comfortable in front of the camera on the big day. Most couples I work with preface our sessions with the disclaimer that they’re a little awkward in front of the camera, which is a totally normal reaction to having professional photos taken, so don’t worry! Wedding photographers are used to this. But a great way for you to get used to being the center of attention (and yes, this is what your wedding day is all about, for those of you who tend to be a little shy) is to schedule a session with the photographer you’ve chosen to capture your wedding memories. You’ll get to know your photographer a little better so he/she will feel more like a friend when showing up on your wedding day, plus you get a trial run before the “main event” to reflect on what you might like or dislike about posing, facial expressions, or other little details. Engagement photos give you a chance to communicate with your photographer about any body insecurities you’d prefer to minimize, or angles or poses that make you look your best. And—bonus!—an engagement session means you’ll have photos of yourself to use for your wedding website, guest book, and reception décor (plus some professional images of yourself in clothes other than a white dress and suit or tux). 4. Keep your bridal party small(ish). Fewer bridesmaids and groomsmen means fewer people to wrangle when it’s time for bridal party portraits, which can be a time-saver and less stress for you. It also means there are fewer restrictions on where your photographer can choose to do these portraits. If you and your groom each have eight attendants (plus four flower girls, two ring bearers, and three ushers), it can be a challenge to find a spot with a pleasant background, beautiful light, AND enough room to line everyone up. My own preference is under five on each side (so ten or less, not including the two of you); having two, three, or four seems to make magic for photos. Don’t get me wrong – if you have a large bridal party, we’ll make it work and you’ll get beautiful photos! But in my experience, your options for location and creativity grow (and your stress level decreases) if you have a smaller group of people to keep track of. 4. Ask your officiant to step aside for your first kiss at the end of the ceremony. Chances are, you chose an officiant or celebrant you connect with and are excited to have with you while you exchange vows. Still, I’ve found the best “first kiss as husband and wife” photos are ones without your officiant in them. The partial view of his or her head behind the two of you as you share a kiss can be distracting and take a photo from frame-worthy to just “so-so.” It’s a small step to the side that can make all the difference. 5. 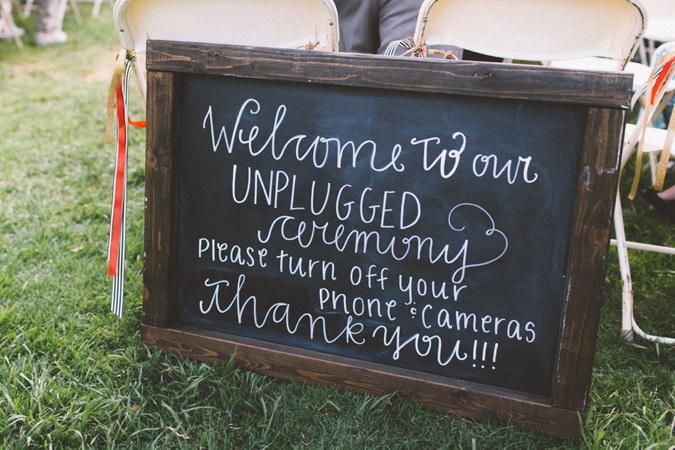 Have an “unplugged” ceremony. Asking your guests to refrain from holding their point-and-shoot cameras or cell phones in the air during your wedding can reduce the potential for distracting elements in ceremony photos, as well as ensure your hired photographer has a clear view and optimal conditions at all times. You hired your wedding photographer to get the best images of the day, right? So it’s a good idea to ask your friends and family to stay seated and get out from behind their devices. This means your photographer can do his/her job effectively, and your guests can truly be present and enjoy the moment instead of worrying about which picture of you they should post to Facebook or Instagram. Implementing an unplugged ceremony can be as easy as a note mailing with invitations, a polite sign as guests enter the ceremony, or a brief announcement from your officiant before the ceremony begins. 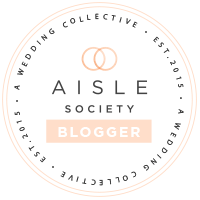 Anna Delores Photography is a member of our Top Wedding Vendor Guide. For more information on how to apply, click here.